Dear ForeUI users, I am so happy to announce that ForeUI V4.0 is released now! We will continue writing blog posts to introduce the new features in V4.0. Meanwhile this final V4.0 also has some bug fixed and includes some important enhancements and performance optimizations, and you can find a full list of changes here. 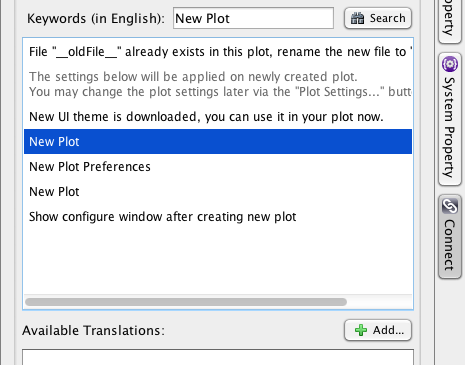 In this version, we made a very useful enhancement, which eases the batch selection in outline view. 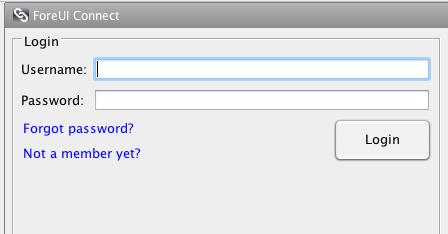 Now clicking on element’s id label has different effect than clicking on the check-box on its left. If you click on element’s id, ForeUI assumes that you want to select this element only, and will clear the previous selection. If you click on the check-box, ForeUI assumes that you want to add/remove the element into/from the current selection, and other elements in the selection will be kept. This small enhancement is reserved for advanced users. ForeUI diagnoses the expressions in the background, this is a very handy functionality. If the diagnose engine thinks an expression contains error, that line of behavior (and its descendants) will be excluded from the HTML5 simulation. This avoids a lot of chances to ruin to simulation with typo. However, what if the diagnose engine misjudges (because of bug or limitation)? This new option allows you to temporarily disable the diagnose engine for specific row of behavior, and make sure that behavior will be included in HTML5 simulation. Please notice that, once you disable the diagnose, you are the only one who can make sure the expression gets right. If it is not, it could halt your HTM5 simulation. So this option is reserved for advanced users, and please try not to use it, or at least use it wisely, if you know what you are doing. If you haven’t installed V4.0 beta before, you need to download the new installer here, and then install it, since the in-app update can not work for this major upgrade. For users who has installed V4.0 beta before, it is possible to upgrade to V4.0 with the in-app update. However, downloading new installer and install again doesn’t hurt anything. If you want to keep the older version, you can choose a different directory during the installation, otherwise the new version will overwrite the older version. 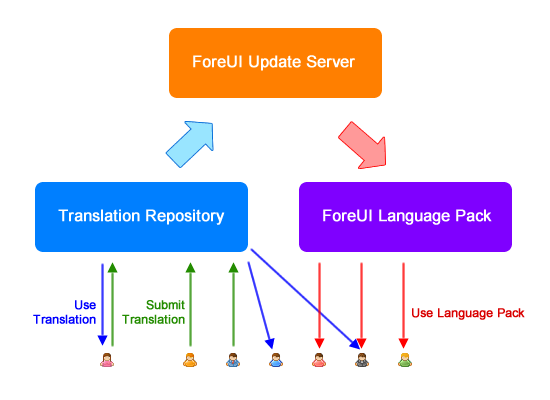 ForeUI V4.0 brings a lot of new features, one of the most interesting new feature is that you can localize ForeUI by yourself, which means you can translate the text you see in ForeUI into the language you want. Previously we include language packs translated by volunteers, which works well. However, the translations need to be updated according to software update, and we have more languages to support. We want to build a platform for it, so everyone can very easily contribute his/her translation. Translating all texts will be a lot of workload, but you don’t have to translate all of them. Sentence or phrase is the minimum unit for translation. You can translate just one sentence or phrase and submit it. Once you do that, your translation will be automatically applied on your ForeUI, and you can enjoy your work immediately. All translations will be public shared. When you try to translate a sentence or phrase, you may see that someone already did it before, and you can use his work instead of translating by yourself. Your translation may also be used by others, the more users choose your translation, the more credit points you will get, and those credit points can be used to get discount on buying/renewing ForeUI license in the future. We will put those translations that are widely used into language pack and push it to all users during software upgrade. You may already notice the new tab on the right side of ForeUI’s main window, and the view has title “ForeUI Connect”, which is the entrance of this feature. ForeUI Connect is a platform for online activity, and translating ForeUI is just the first feature we implement on it. You will need to login before using this feature. The login account/password is the same you used to login our website. If you don’t have an account yet, you can register one here, or click the “Not a member yet?” link in the view. If you like this translation, you can select it and the click the “Use It” button. 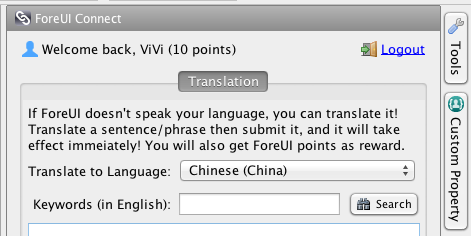 The more users use a translation, the higher chance that it will get included in future language pack. If the translation was submitted by you, you can also edit or delete it here. 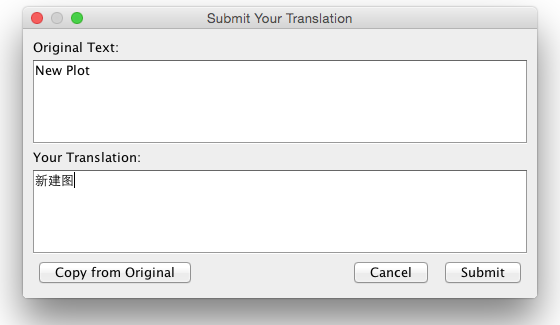 If you don’t find any existing translation can satisfy you, you can submit your own by clicking the “Add…” button above the list. 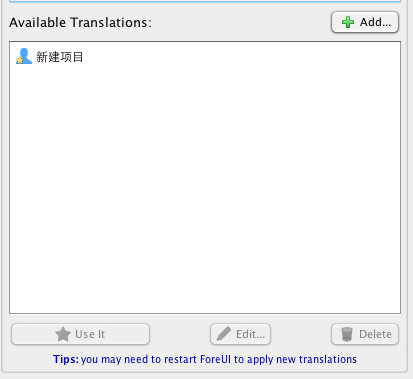 A window will pop-up and accept your new translation. After clicking the “Submit” button, congratulations! You just contributed one translation to the repository! Meanwhile you will be able to switch to the language that you are translating ForeUI to, and see the translated text in ForeUI immediately.